글로벌 디지털 플랫폼 GMI POST는 지난 8월 25일 아시아 특집편 교육 기사 중 CMS에듀를 보도했습니다. 4차 산업혁명의 리더를 키우는 미래교육으로 자사의 융합사고력 교육을 중점적으로 다루었습니다. 씨큐브코딩의 생각하는 코딩교육이 주목받는 이유이기도 하지요. As South Korea embarks on the “Fourth Industrial Revolution,” businesses have had to keep pace with rapid advancements around them in order for them to thrive and stay relevant. As countries identify which industries to support amid this huge shift, a South Korean educator is calling on parents and society to change its approach to nurturing a new generation of leaders. 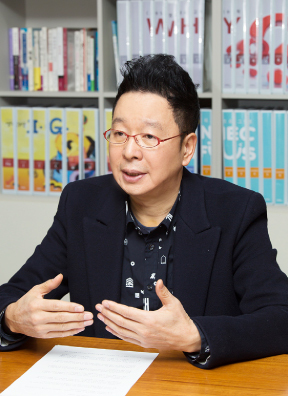 Inspired to enhance creative thinking in children, CEO Lee Chung Koog opened his first learning center in Seoul in 1997. Twenty-one years and more than 30,000 South Korean students later, CMS Edu now has 65 centers spread across South Korea. It has also launched its franchising business in China, Thailand, Vietnam and the United States. Students of CMS Edu are encouraged to have hands-on exercises as part of its learning experience. That vision to grow has not waned. CMS Edu successfully launched its IPO in 2016 and seeks new partnerships with education institutions around the world. “One of my main goals for our global business is to create a network wherein countries can fully grasp our unique methodology. More importantly though, we are looking for partners who won’t think of a partnership only in terms of sales and business, but who want to enforce a way of learning that will truly benefit the future’s leaders and decision makers,” said Lee. For Lee, this shift in thinking caused by so-called Industry 4.0 is similar to past challenges posed by drastic changes in business and production. Today, leaders of governments and industry again face the daunting task of reconditioning their economies and companies to ensure their long-term sustainability. “Most people have a nonchalant attitude or simplistic concept of what the Fourth Industrial Revolution really is. That shouldn’t be the case when dealing with it,” Lee stressed. Having visited many countries for his business, Lee has seen that the education sector worldwide has not adapted accordingly. Schools have not formulated a suitable method of teaching that prepares their students for Industry 4.0. “Some universities and economies have focused on certain fields, like ICT and biotechnology, and other highly advanced fields. In Korea, it’s all about those fields now,” Lee explained. “But, the problem with that is educators only supply students with information and knowledge on those fields without recognizing that those fields may not address what we will need in facing future problems,” he added. If that attitude continues, Lee fears that a new crisis may happen when another industrial revolution arises. So, CMS Education prepares its students for whatever changes may come in the future. “We need to teach students how to think, how to use knowledge, and how to go beyond the information being fed to them. We want our next leaders to be able to think better, or else nations around the world will find it impossible to catch up with constant changes everywhere,” he said. To help its students gain a competitive edge over their peers, CMS Edu adopts what it calls “fusion education,” which involves merging various fields of knowledge and allowing those students to come up with solutions to problems from multiple resources. “Here in CMS Edu, we are continuously developing new contents for our students, so that come the next paradigm shift, instead of scrambling to enhance their skill set, they can come up with their own jobs. They can rise above the current system and come up with the new one,” Lee said. The way the world works right now, education is just a subsection among different fields that run a country. But that’s not how it’s supposed to work,” added Lee who believes that education must be an overarching field that allows all people to discuss the economy, technology, or any other fields substantially. According to CMS Edu, if students understand the bigger picture and comprehend how the world works with convergent and fusion knowledge of diverse areas, it will be easier for them to identify which information is ultimately relevant. Then, they may use this to their advantage. “In Korea, CMS Edu is the pioneer in convergence education. It will be our transformative tool in thriving and becoming more innovative in this world,” he said. To train its students, CMS Edu does not follow trends in teaching style or method. Instead, it developed an enduring methodology that allows students to learn and adapt to whatever comes their way. Lee explained that the institute’s name adheres to its philosophy. CMS or Creative Maieutic School reflects its adherence to the Socratic method of teaching, which teaches students how to think independently, communicate effectively and reach a consensus. Upon proposing a topic to discuss, teachers first let students make observations freely and start to develop curiosity about the topic. This helps them retain details better. Later on, to improve their grasp of concepts, students are put into groups so that they can deliberate the given issue. Teachers will also pose convergent questions and allow students to examine and exchange their views, which improves communication skills and builds confidence in their own thinking. At the end, students must reach a consensus that will be conveyed to the teacher. “While students initially think alone, their arguments become stronger and more grounded with input from the rest of the group. They learn the value of independent thinking, as well as team work and harmony,” Lee said. “At the same time, through divergent questioning, the students find their own direction and start to consistently think for themselves,” he added. Working together globally Having established a firm foothold in Korea, CMS Edu has become more aggressive in its global activities. In April, it opened a new center in Vietnam. To continue with its rapid growth, CMS Edu is looking for new partners. “Because education is a global need, we do not have a checklist or particular order of countries that we will target. To us, what is more important is to meet partners who are ready to accept this new method of teaching,” Lee said. “There are so many teaching trends right now that are part of larger schemes, but institutions nowadays mostly take out one program and use only that for the students. As the whole process or method was not employed, the whole procedure becomes ineffective, and in the long run it won’t bring forth the fruits aimed for in the beginning,” he also said. Young Korean children learn early on about teamwork and consensus. CMS Edu wants partners who share the same vision of creative and innovative education and raise a new generation of innovative and creative leaders. “Education will always be relevant. It has always been important. It continues to play a key role in the development of humankind. As we transform to become a more advanced society, education will become even more essential,” he said. While all sectors find common ground for collaboration, CMS Edu remains committed to transforming Korea and its next generation of leaders. “We are currently going through the 4th Industrial Revolution, and no matter how much we prepare for it concretely, it will be hard to predict what will happen beyond that – and the things we will need to survive will change,” Lee points out. “Korea is thriving currently but we don’t know what the future holds. Global companies can attack Korea in various ways by coming up with new industries, technologies, and strategies. But Korea will continue to excel if it knows how to prepare for anything by learning how to think, how to use knowledge and look for new ways to thrive,” Lee said. “Educators have to always look forward and be one step ahead. And that’s what we are here for,” he added.